Hampton Group students Matthew Gira and Matthew Milliken attended the American Chemical Society’s Spring National Meeting in Denver, CO from March 22 to 25 along with Jennifer Hampton. 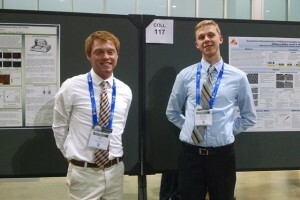 Matt and Matt presented posters on their current research. Jennifer Hampton also presented a talk on the group’s research.